Whilst futsushu is not a ‘special designation sake’ it can have a lot to offer and should not be overlooked. Ancient Mountain is a particularly good example of a well-balanced, rich futsushu that pairs well with food and is easy on the wallet. 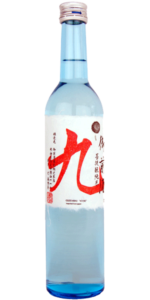 Delicious and warming, this sake has notes of sweet cereal, soy and mushrooms on the nose, with smooth & creamy rice flavours resulting in a rich, medium-bodied sake with light acidity; excellent for day to day drinking. Heated, the flavours mellow & the sweetness is highlighted, it is a spectacular winter-warmer at 50°C. A great, every day, entry-level sake: easy drinking and highly versatile. Also available in 1.8l format. Great enjoyed on its own or with meaty flavours. Yakitori, tonkotsu ramen, pork.